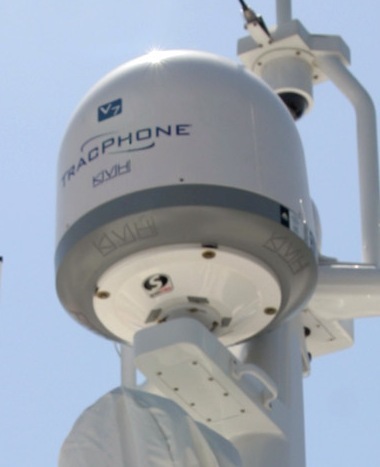 KVH is the clear leader in providing a 2 axis, 60cm VSAT Tracphone V7 service bundled with several levels of prepaid and postpaid airtime at rates suitable for a 20-30 meter luxury yacht or commercial vessel. They are rapidly expanding their coverage areas to include the most traveled regions of the world. The KVH mini VSAT service is provided in partnership with Viasat, utilizing their Viasat Yonder network for aircraft. The system uses 12 satellite transponders and 9 teleports to provide almost global coverage. Although only a 2 axis stabilised antenna, the polarization axis also dynamically follows the movement of the vessel, making it effectively a 3 axis system. This includes unlimited data use and phone calls as low as 5c per minute, depending on the destination on up to two phone lines. The seasonal rate plans cost quite a bit more per month, but allow you to suspend the contract for up to 9 months at a layup rate of $195 per month. This could be cost effective for vessels that are only in use during the summer or winter seasons. This also allows practically unlimited data use and low cost voice calls on two phone lines. In addition to the popular, fixed rate and seasonal rate plans, KVH have now included a metered plan similar to the new V3 rate plan, with monthly fees as low as $49 for 50MB of data and phone calls to and from anywhere for 49c. For both the V7 and the V3 this plan includes only one phone line. You pay a flat rate of 49c per minute for phone calls both for incoming and outgoing calls to anywhere in the world. The phone calls do not count against your data plan while you are using the phone. Thrane &Thrane Sailor 700 VSAT and JRC. Thrane & Thrane sell the KVH V7 and the mini-VSAT services under the brand name of Sailor. JRC are also distributors of KVH antennas and mini-VSAT services. 32202 visits to this page since 28 Nov 2012.